Trap music is a saga of a gritty, motivational truth. Although some may listen to Gucci Mane, Waka Flocka, (early) T.I., 2 Chainz, Future, Migos or Jeezy for the soulful synths, snares, 808s, and country grammar, others listen for the tales of struggle to triumph. While mainstream trap music might be detached from its roots having become new wave EDM, bona fide trap music still manages to be celebrated, in social settings where all can rap along, and even at the most intimate and spiritual of yoga sessions. Undoubtedly, music can (and does, from my own recollection) shape the way we experience moments, make memories or aspire to be our highest selves. Such was the case when I found myself rapping to lyrics I had recited many times before and nodding my head to beats that accompanied the pound of the bass, which made the floor vibrate from under me. When I first took Brandon Copeland's Trap Yoga class last summer, I knew I was going to get more than I had signed up for. I sat in the perfect spot next to a fan, which I soon learned was a heater. And by the end of the class I was dripping in sweat and wondering if I could find his playlist somewhere on Soundcloud. 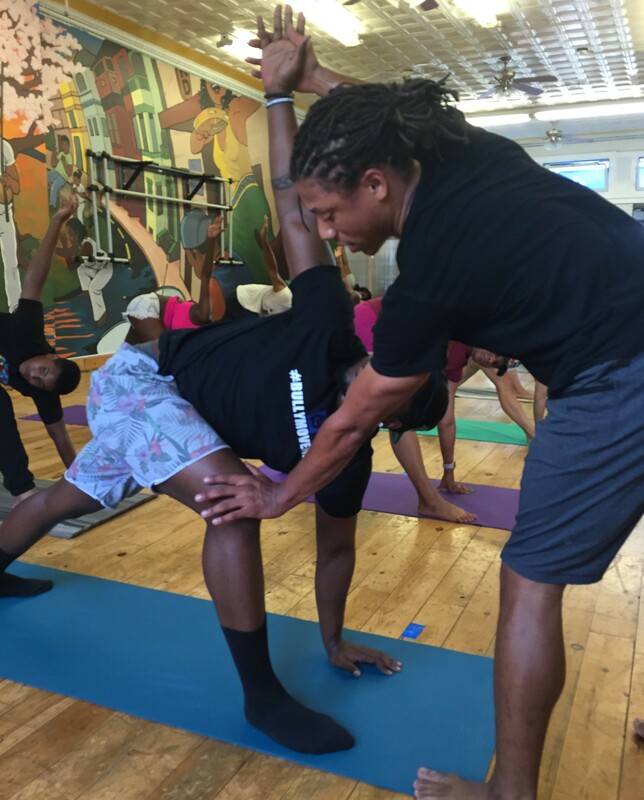 Since then, the 26-year-old yoga enthusiast and now owner of Khepera Wellness Yoga studio, Brandon Copeland, has continued teaching yoga to both beginners and vets, prescribing trap for wellness and healing. I sat down with Copeland to discuss his approach to yoga, building the black community and his response to the killings of unarmed black men by police officers. Blavity: What is Trap Yoga? 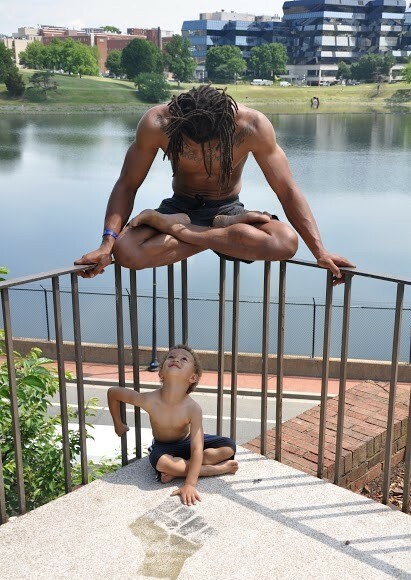 Brandon Copeland: Trap Yoga is a power yoga class held at my studio, Khepera Wellness, in Washington D.C. that incorporates trap music with movement. I came up with the idea from my own practice and love for all things trap music. I realized that when I was not in the studios around the city which mostly played Zen music or mainstream by white artists or Asian [artists], I listened to my favorite music — hip-hop and rap. I found that the intense work that I was doing on the mat in my particular style of yoga, 'Rocket,' was best inspired by the music hustlers I listen to. Being an ATLien, trap music was naturally the motivation I used. When I mentioned the #TrapYoga classes on my Instagram people responded so powerfully that I had to create the experience for everyone. B: How does trap music inspire your practice? BC: Trap music has always helped me work harder. There is something about the way that the music is produced that draws out the best of me. I like how artists connect with the soul of the listener. Aspirations, hard work, and the problems of life are the content that fills dope, heavy beats. When I hear trap music, I want to be better, do better. I feel the same way on the mat. I am consistently using what I already have to get what I need and have to recognize that my circumstances do not determine the outcome of my life. The journey is the destination in trap music and in yoga, especially in power yoga. Of course we all want a million dollars and the perfect handstand. Hustlers and yogis realize that the journey to those things teaches you much more about yourself than gaining them ever will. B: How did your practice become your full-time profession? BC: I couldn’t stop teaching. I started out skeptically, taking one class off of the suggestion of my son’s mother. After taking Ashtanga yoga I was hooked. I kept taking classes and eventually was volunteering at the studio, checking people in, cleaning the space, learning the trade. I was able to turn that ‘internship’ into attending the studio, Yoga District: Bloomingdale, teacher training. After I finished the training in 2012, I was nervous about not being up to par and limited my classes to teaching on Howard’s campus to friends in dorms, on the Yard, basically anywhere a mat could unfold. After about a year, I began teaching in studios around the area and really growing into who I am, on and off the mat. I felt the gaping hole of being the only black person in most classes and not feeling blackness as a major part of the studio life. I became determined to change the scene and attract people like me that would love the practice AND the sense community that black people vibrate highest in. B: You’re also a full-time dad. How important is it that you pass your practice on to your son? BC: It’s of the utmost importance to me to pass on the effects of wellness practice to my son. More so than just being a yogi, I want him to understand that his happiness, clarity and well-being are his highest priorities. Yoga is just a tool that I use to bring peace to my life. I know that it is a powerful tool that does the same for many people but we all are different. Some people feel the same feeling of connection to life through running or knitting or making music or whatever. I use yoga to show him physically that he can strengthen, heal and calm himself. 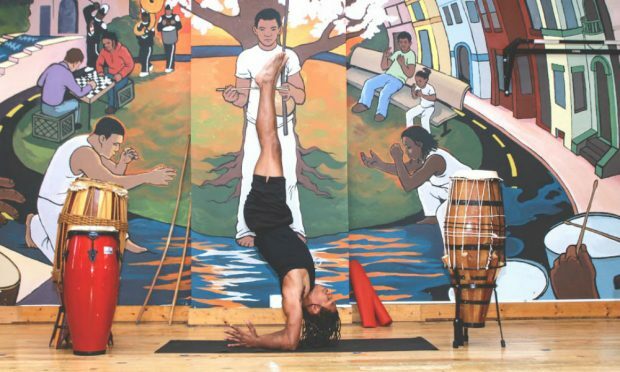 How he chooses to do that as he grows, through yoga or capoeira (an Afro-Brazilian martial art he practices) is up to him. I just want him to be happy and to know how to allow happiness to flow from the light he shares with the world, however he chooses to share it. Actually, I hope that he learns meditation from me and makes that a major part of his life. Being able to meditate proficiently is the reason we practice yoga in the first place. B: How important is community to you? BC: Community is life. The people around you inspire you and actually give you life. Being a part of the black community contributes to how I view many things. Influencing the black community determines what kinds of moves and decisions I make with my business. It is a dream of mine to inspire other black people to do wellness practices together on a mainstream level. I want yoga to be a “black family thing” and not just a “white girl thing,” like I often hear from brothers and sisters who have not taken the practice themselves. I could have very easily kept my little mat and weird sounding poses (ArdhaBaddhaPadmaPaschimottanasa) to myself. It was not very cool to be doing yoga on the Yard at Howard when I first started. My love for my community compelled me to share the magic of yoga with my peers, despite the jeers and stares and occasional comments. Community is how we have survived and thrived as a people. I can’t help but recognize: I am because we are. B: That said: What has your response been to the police brutality that's resulted in the most recent murders of innocent black men within our communities? BC: I'm doing a few classes at my studio in response to the deaths of Alton Sterling and Philando Castile, along with the countless deaths we've seen. Trauma relief. I'd like for people to understand that yoga is used to heal and not a result of being healed. B: How did you come up with the concept for Khepera Wellness Yoga Studio? BC: I came up with Khepera Wellness in my Egyptian Philosophy class at Howard. The concept of Khepera is spontaneous evolution. I was sitting in class studying the Egyptian creation story and realized that, like all of the Egyptian concepts regarding nature and Ma’at, it was a story as much about me as the deities that represent different ideas. Khepera is the anthropomorphized concept of evolution. Khepera helped Ra, the sun god, produce himself from Nun or chaos as a form of pure energy. When I read the story, I felt a connection with my yoga practice. When I first began to practice, I was freaking out about the birth of my son. I was a junior at Howard then and felt completely hopeless and lost before I discovered yoga. From that chaos in my life I became a strong and dedicated father. I thought of all of the Black people faced with chaos every day that had not discovered yoga or wellness and recognized that we all have that pure energy within us. I wanted to bring that beautiful light out of my beautiful people and the concept of Khepera represented yoga’s role in my life doing just that: Helping me shine brighter. I named the studio Khepera Wellness because I believe that returning to the source in your own life is the best way to produce your best self. We do that in our classes and do our best to live by the mantra: Evolve Your Self. B: What yoga mantra do you live by? BC: “All is coming.” The whole statement is “Practice and all is coming,” but I live by the last 3 words. It reminds me that God and life are bigger than me. It reminds me to live fearlessly and to know that at some point, my connection with existence, God, or All is becoming clearer and clearer. B: What can people expect from you in the near future? BC: MORE TRAP YOGA. I will be offering my online courses in the fall and am working on a few different series and workshops. I’ll be doing a lot of programming with schools in the Washington D.C. area and will be working with more athletes in the coming months. I am in the process of organizing Trap Yoga brunches and other social events that help weld the power of yoga with the power of the black experience. You can always keep up with me, holla at me, or sign up for classes (best option) by visiting our website, www.kheperawellness.com or following @BrandoFlows (personal) and @KheperaWellness (business) on our Instagram and Facebook. I am always open for ideas and partnerships that help spread our message and offer opportunities for more black people to get on the yoga mat. Namaste.